Mayrhofen has kept architectural integrity of a traditional Tyrolean village while being a contemporary and modern resort. Hintertux glacier is located nearby guaranteeing breathtaking views while you enjoy your ski holidays - it is a great place to start or to improve your skiing experience while having your dream vacation. Transfer to Mayrhofen from one of the nearby airports can be done in ease and without overpaying if you choose Alps2Alps as your transfer provider. Located at the state of Tyrol, resort traditionally has been a British favorite, but you can find winter sports enthusiasts from the whole world. It has a lively nightlife, but at the same time, it is an excellent family resort. Some pistes at Mayrhofen were used for World Cup of downhill and there is a special funpark geared towards snowboarders needs as well as excellent ski schools ready to help you to improve your skills in this masterpiece of Austrian Alps. There is a direct train to Mayrhofen ski resort. First, you need to take InterCity rail services stopping at Jenbach, then the Zillertalbahn train to Mayrhofen. Choose your transfer to Mayrhofen in midweek (Monday-Friday) to get prices up to 60% lower than usual weekend prices! Book your transfer during the off-season and off-peak and save even more. The final transfer price to Mayrhofen will be affected by vehicle availability and vehicle utilization, transfer schedule and other costs like road tolls and airport parking fees. In order to discuss any specific needs of your trip to Mayrhofen or your plans to travel as a larger group, please get in touch with us directly. The resort is a part of Zillertal ski area. 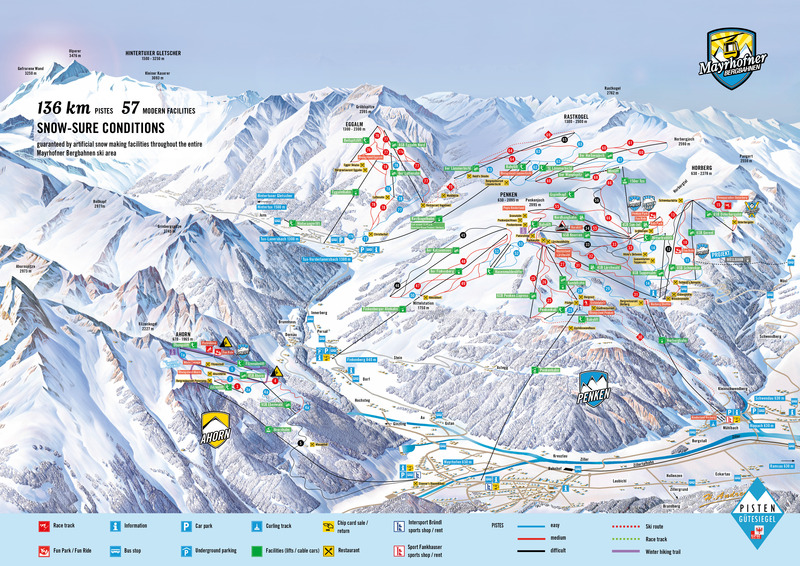 With the right ski Lift Pass, you can access a total of 489km of pistes that area has to offer at Fugen, Tux-Finkenberg and Hippach ski resorts. Mayrhofen is snowboard-friendly and provides other winter sports activities too. Although there is an active nightlife at Mayrhofen, the resort itself is family friendly. It offers great discounts and plenty of apres-ski activities for every taste. The local ski schools and kindergartens are highly regarded, there is also a fun pool with a special childrens area. Mayrhofen is very popular during wintertime - therefore we recommend to book your transfer in advance. Write us or call us and let Alps2Alps know your travel plans to Mayrhofen ski resort - we will be happy to provide you with a great start to perfect ski holidays.